It’s that wonderful time of year again when you’re accompanied by used tissues wherever you go, you have to wear extra makeup to cover up those puffy, allergy eyes and you’re nose resembles a certain red-nosed reindeer. Yep, it’s spring, and while that means blooming flowers and vibrant plant life, it also means allergy sufferers are feeling miserable. But, Scott & White allergist, David R. Weldon, MD, said you don’t have to go through another spring suffering from your symptoms. He offers some tips to help you stop the stuffy nose before it starts. During the time of year when you know you’re going to be affected, try to stay indoors as much as possible. If you play outdoor sports or enjoy being outside even during allergy season, you may want to talk to your doctor about allergy shots. When you get in your car, make sure your air conditioner or heater is on recirculation and not fresh air. And avoid riding in the car with the windows down. Both of these methods will help to limit the pollen and allergens you are exposed to. And even though the weather is mild and enjoyable during the spring time, it might also be necessary to keep your windows closed in your home in order to keep that pesky pollen from getting to your nose. “If your nose is not congested, but runny, then the saline [nasal] drops are very effective as far as washing out the pollen and other allergens that promote the allergic response,” Dr. Weldon said. The allergist said that the problem is that most people wait until they are already congested before using the saline drops, which makes the product less effective. If you miss your window, then a topical nasal decongestant might be your best option. But, Dr. Weldon suggests talking to your doctor before using one of these products because they can be addictive. Studies have found that a large amount of pollen in the air gets attached to your hair. The hair acts a pollen filter, collecting the allergy-inducing particles. To combat this problem, Dr. Weldon suggests washing your hair before you get into bed every night during allergy season. If you’ve noticed a pattern emerging year after year with your allergy symptoms, then it may be time to make an appointment with a board-certified allergist. For more information about allergies and what you can do to relieve your symptoms, Dr. Weldon suggests checking out the American College of Allergy, Asthma & Immunology’s site acaai.org. How do you combat your annual allergy woes? 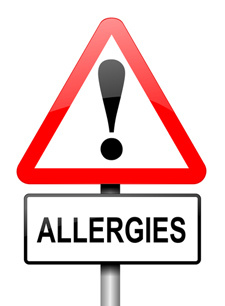 What advice can you give other allergy sufferers?